Ireland has nine resident bat species, each unique in their diet, habitat choices and physical appearance. For The Vincent Wildlife Trust, one species has been at the heart of our conservation work in Ireland for over 25 years, and fascinates us in a particular way – the lesser horseshoe bat. First observed in Co. Galway by Professor William King in 1858, this species has, over time, been known by a variety of names owing to its distinct characteristics. Previously it was known as ‘The bat of the aristocracy’ because of its penchant for old unoccupied grand buildings and castles, but today we are calling it ‘The bat of the Wild Atlantic Way’ – as it occurs only in Mayo, Galway, Clare, Limerick, Kerry and Cork. Its preference for the west coast is due to the milder climate experienced in this region, for example, the lack of severe frost in winter, and the availability of natural caves for hibernation, particularly in Galway and Clare. Lesser horseshoe bats are the smallest and most easily recognisable Irish bat when roosting. Other species can crawl out of sight between bricks, gaps in masonry, or a crack or crevice in a tree. The lesser horseshoe bat is physically unable to crawl, so hangs freely upside-down from the roof of an attic or cave, wrapping their membranous wings tightly around them like a cloak. From April to September they rely on old unoccupied buildings with openings large enough to fly through, using these sites as maternity or nursery roosts. The inability to crawl also means that lesser horseshoes are the only species that cannot use bat boxes. These bats favour farm buildings, especially those with a natural slate roof because these provide warm conditions in the apex of the roof. The farm’s hedgerows and stonewalls also provide important flight paths for the bat. Lesser horseshoe bats emerge approximately 20 minutes after sunset to feed on insects including midges, crane-flies, caddis flies and moths. 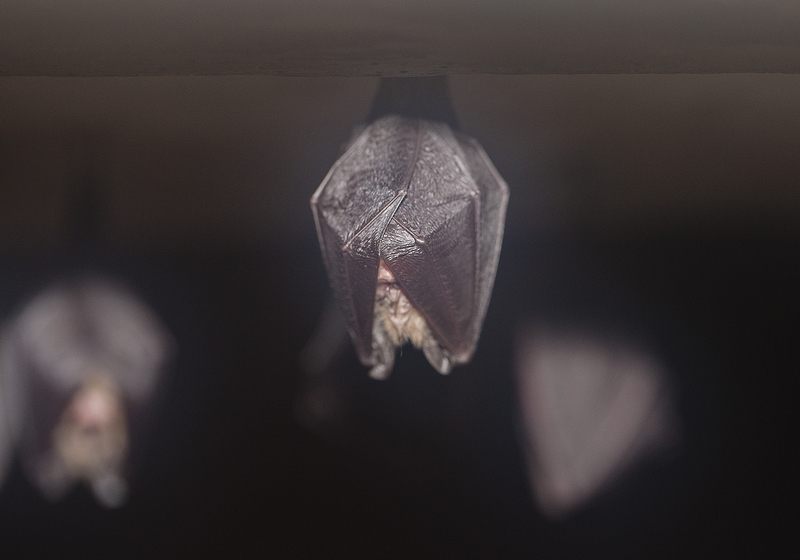 All Irish bats are insectivorous and, because a single bat will consume thousands of insects every night, they are a natural and vital form of insect control. Lesser horseshoes will travel up to 2km at night following a mosaic of linear landscape features such as hedgerows, treelines and stonewalls to forage in nearby broadleaf and mixed woodlands, often resting for short periods in porches and sheds, before returning to the roost before dawn. Contrary to popular belief, bats have adequate eye sight. To thrive, however, in the low light levels between dusk and dawn they ‘see’ their surroundings with sound, using modified vocal chords to create ultrasonic waves also called echolocation calls. The sound waves bounce off objects in their environment and generate echoes that return to the bat. This highly advanced navigational system allows the bat to detect the wing beat of a caddis fly, glean a small moth from a leaf and fly ‘butterfly like’ through cluttered woodland. 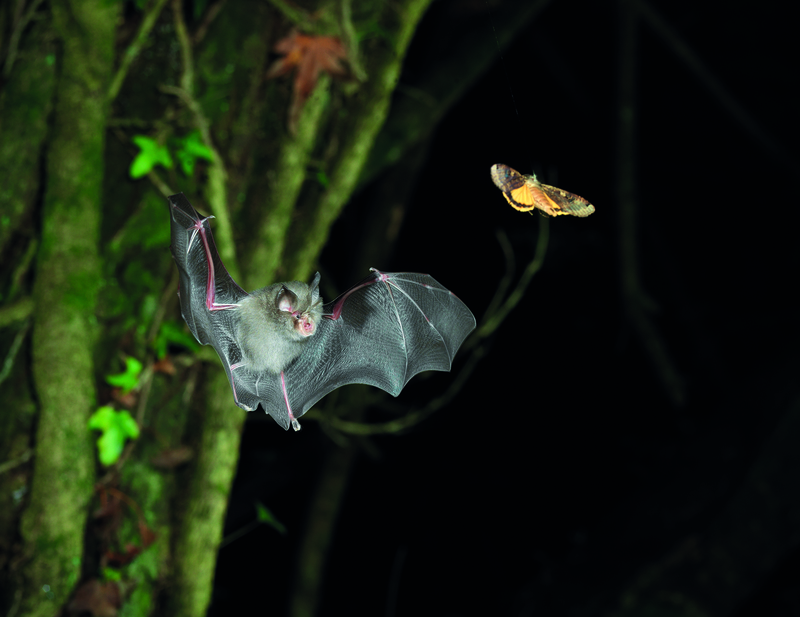 Thankfully we can hear the ultrasonic calls of bats after they are transformed by a piece of equipment called a bat detector, and so we can often identify the species of bat on the wing. The echolocation call of the lesser horseshoe is especially distinctive, sounding like a melodic warble (see video). At a frequency of 110 kHz, they are more than twice as high as that of the nearest bat call (a soprano pipistrelle at 55kHz). The lesser horseshoe further enhances its echolocation with a flap of skin around its nostrils in the shape of a horseshoe – hence its name. Lesser horseshoe bats mate in autumn and the female delays fertilising the egg until the following spring, to coincide with warmer temperatures and a greater abundance of insects. She gives birth to a single pup in June or July, which stays in the roost for the first six weeks. A wet spring and summer can extend pregnancy, meaning that later born pups have less time to develop before they hibernate for winter, which is often a time of high mortality. Pups were born in early June this year, due to the recent warm weather. Therefore, we hope that the class of 2017 will go into winter hibernation stronger and with a better chance of survival. From October to March lesser horseshoe bats hibernate underground in mines, cellars and caves, dropping their body temperature to that of their environment (approx. 8oC) to conserve energy when insects are scarce. During mild winters they may emerge after sunset to feed, particularly on insects associated with the dung of grazing livestock. This species is at particular risk in Ireland because they are restricted to a small region of the country. A gap of up to 70km has opened up between known maternity colonies in Limerick and those in north Kerry. Research has shown that colonies south of this gap in Kerry and Cork are becoming increasingly genetically different from those in the north (Mayo, Galway and Clare), which may affect breeding success in the future. This divergence could seriously impact the survival of the lesser horseshoe bat in Ireland, particularly as the current population is estimated at only 14,000 individuals. The species faces further threats such as habitat loss due to hedgerow clearance, woodland removal and agricultural intensification. Summer roosts are lost through dereliction, demolition or disturbance and hibernation sites may be flooded during particularly wet winters. 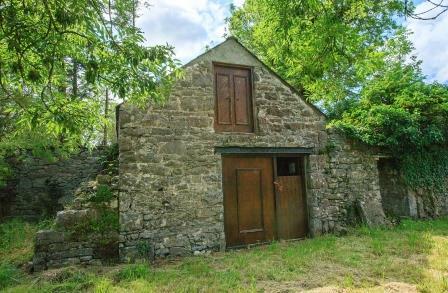 The Vincent Wildlife Trust manages 13 maternity roosts for the lesser horseshoe bat throughout its range, all of which were in various states of disrepair, and transformed them into secure undisturbed buildings free from draughts, disturbance and predation from birds or other mammals. We monitor these sites annually as part of the National Monitoring Programme and work with farmers to advise on ways to improve a building for the species, and how to enhance the surrounding habitat to further aid its conservation.